Sanctuary rabbits are special rabbits who are no longer likely to be adopted but remain in the Indiana House Rabbit Society's care. 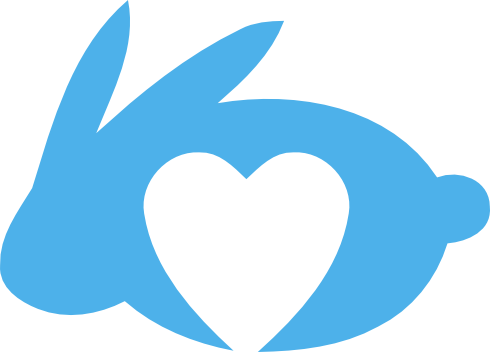 They are provided endless love, long-term care and support. Curly was found as a stray in Greenwood, very skinny and with eye infection. She was turned into an Indiana shelter, who helped get her weight back up and treated her eyes. But Curly was kind of stuck at the shelter... they didn't have a spay/neuter connection, and Curly was getting cranky about being there. IHRS came in to take Curly to foster care after she'd been at the shelter a couple of months. One thing we discovered while at the shelter: Curly has terribly maloccluded incisors! One of her top teeth curled right out of her mouth, and the others were really wonky. Since rabbits' teeth grow continuously, this condition will only get worse and will lead to starvation. Ms. Curly received a prompt dental exam from an experienced rabbit veterinarian. She has now had three dental surgeries with multiple extractions and more are likely. Unfortunately, Curly's cheek teeth (molars) are even worse than her incisors, basically crumbling out of her head. She has had a CT scan to help the vet perform the dental surgeries with the best information possible. If Curly could become stable with her dental woes (which may also fix her ongoing eye discharge and grooming issues), she would be available for adoption. However, the extent of her dental issues is so severe, her veterinarian feels she should remain in sanctuary status. 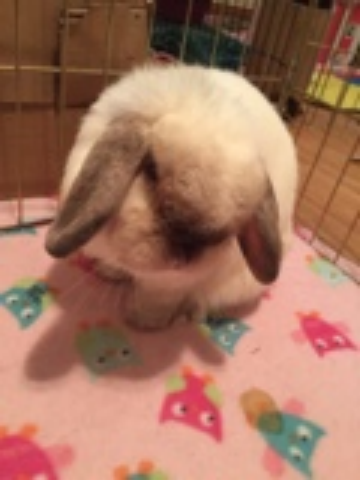 She has an unknown and probably dismal future with her teeth and therefore needs a very special caregiver with access to a great rabbit vet with dental skill. We are supporting Curly with special foods and antibiotics for her dental infections... she's having a hard time eating. Curly is curious and thankful for food and attention. She could use your well wishes and your financial support as she recovers! She has a great spirit and says to keep the apple-banana flavored Critical Care coming! View Curly's full bio, including more photos! Fuzzer is a somewhat cranky little dude who came to rescue when his elderly owner was hospitalized. Fuzzer has some mobility issues and leaves a lot of messes around his pen. He has significant grooming needs and favors a low entry litterbox. Fuzzer is super cuddly with his two girlfriends. He spends almost all of his time parking his head across the back of one of his friends, even if it means they can't get up! Fuzzer may not love people much but he's so happy with his bunny friends we don't mind his attitude. Because of Fuzzer's age, grooming, and health issues, he is in sanctuary care. He is not available for general adoption but will continue to have a safe home with his buddies and excellent veterinary care. Donations to help offset Fuzzer's needs are appreciated. View Fuzzer's full bio, including more photos! 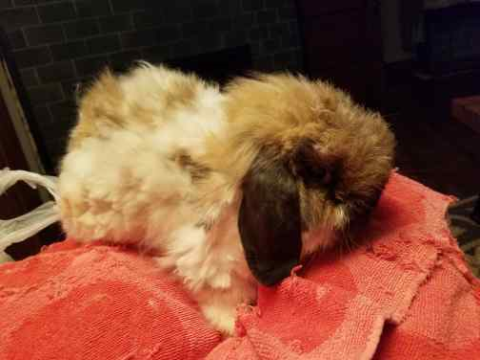 Helen is one of the rabbits from the 215+ Holland Lop/Lionhead confiscation of December 2013. She was confiscated because she was living in an unheated garage in fetid conditions. Helen came into rescue very ill (February 2014). She had bilateral indolent corneal ulcers, which we worked extensively with a veterinary ophthalmologist to help them heal. She is now in a foster home where she is supervised to ensure that her healing remains on track. Helen is a super sweet bunny who is active and curious. Her adopted family will need prior bunny experience. If you are interested in adopted Helen, you will be rewarded by earning her trust and watching her unfold like a blossom in your family. 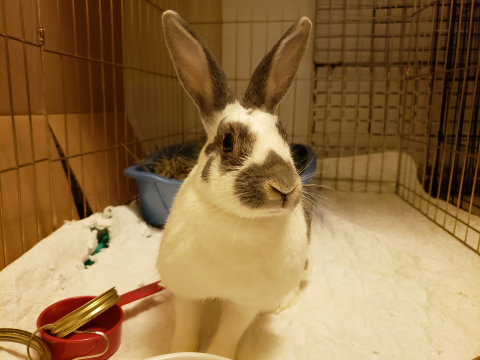 Helen will not likely be a lap bunny who loves lots of snuggles (many bunnies aren't), but she will express her love and appreciation for you in many, many other ways. Are you ready to learn the language of Helen's love? View Helen's full bio, including more photos! Little Nemo was lucky - he and several other rabbits were abandoned after 4H and left to die. Nemo made it and the police brought him to a southern Indiana shelter. When IHRS came to check on the bunnies, our volunteer found he had a crazy curly incisor sticking out of his mouth! Nemo is lucky this was discovered before it grew enough to block his eating; dental issues like this can lead to starvation. Nemo had his offending tooth removed by an exotic veterinarian. We waited to see if the remaining incisors would line up, but they needed correction. But when Nemo went back for removal of the remaining incisors, the vet discovered he had an abnormal heart. Nemo had an ultrasound to determine what is going on. Unfortunately, the results show he has an enlarged heart, known as cardiomyopathy, which ultimately is expected to lead to heart failure. For now, Nemo is being monitored by his veterinary staff and gets lots of personal attention in foster care. He gets heart medication daily and also has ongoing medical needs with checkups and diagnostics. Any support you may want to provide to his medical care is very much appreciated! Nemo is loved and enjoying his life, and we wouldn't have it any other way. View Nemo's full bio, including more photos! Oscar along with his bondmate, Emmy, were rescued from a municipal shelter when their time ran out after being residents for over 6 months. They were devoted to each other, though Emmy passed away earlier in 2016. Oscar loves to be petted. He loves to explore and hide in cardboard boxes and chew them up. 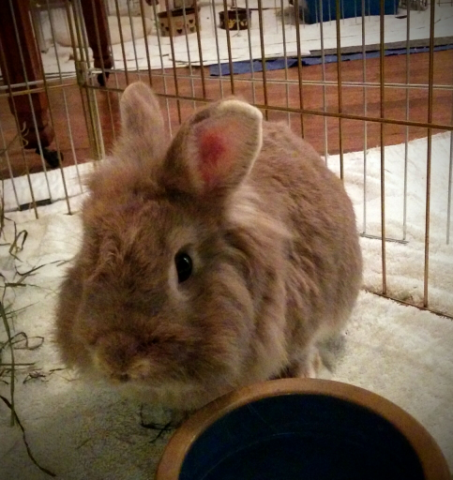 Due to Oscar's age, he is listed as a sanctuary bunny with the rescue and will remain with us. But he would appreciate sponsorship/donations for his daily and veterinary care! If the right elderbunny girl came along we would consider placing Oscar with her. View Oscar's full bio, including more photos!